Sumit Dhar brings strong clinical and research experience to AHRF and its Research Committee. After receiving his BS in 1992 in Audiology and Speech Language Therapy from the National Institute for the Hearing Handicapped at the University of Mumbai, India, Dhar served as a clinical audiologist and coordinator at the Speech and Hearing Institute Research Center in India. There, he oversaw audiology clinics and schools for the deaf. 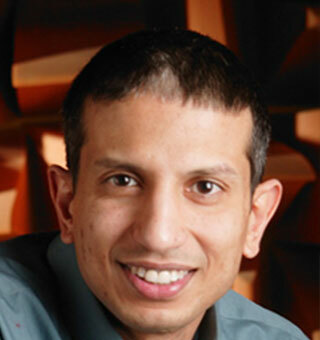 Building on that early practical experience, Dhar went on to earn his MS in Audiology from Utah State University in Logan, and his PhD in Hearing Science (with a minor in Neuroscience) from Purdue University. After graduating from Purdue, Dhar joined the faculty at Indiana University, Bloomington, as an Assistant Professor. Now at Northwestern University at the Roxelyn and Richard Pepper Department of Communication Sciences and Disorders, his research focuses on understanding the physiology and biophysics of sounds created in the inner ear. He is particularly interested in identifying ways to detect hearing loss and other disorders of the inner ear as early as possible through the analysis of these otoacoustic emissions. Dhar is a long-time advocate of hearing healthcare delivery and removing barriers to access and affordability so more people with hearing loss can benefit from treatment as early as possible.